Seriously, my big tip for the summer is to make the marinated beans with 6 Tbsp vinegar and 1/2 cup olive oil and two cans of beans, scoop out about two cups of beans to eat on green salads later in the week, and use whatever beans and vinagrette is left for your quinoa salad. Measure vinegar into a large bowl and add a generous amount of salt and pepper, and a little bit of minced aromatics like onion or shallot or garlic if desired. Drizzle the olive oil over the vinegar and whisk it in. Rinse and drain the beans and marinate them in the vinaigrette. Trim and cut up the broccoli into tiny florets and slivers, and drain and dice the roasted red bell pepper. If you made a double recipe of beans, put away about two cups for green salads. 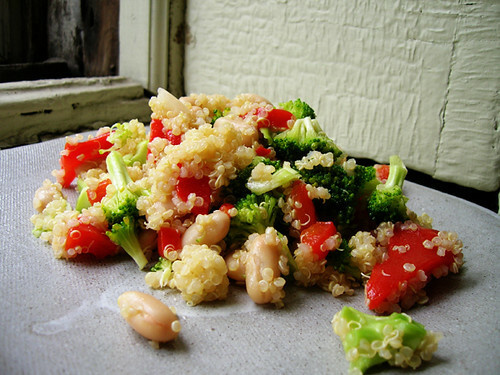 Toss the broccoli and pepper with the rest of the beans and vinaigrette.